What about all that stuff? My Etsy store has naturally wound its way down — turns out that finding an item, photographing it, editing the photos, posting it and then packaging and shipping it just to maybe make between $7 to $12 dollars wasn’t a great use of my free time when my day job already requires a lot from me. However, I’ve still been slowly amassing cool thrift finds and that doesn’t mesh well with the journey to minimalism that JT described the other day. So I’m going to try out a local pop-up vintage market and see about having a stall once or twice as a way to sell off items to good homes. I still have to do the application and get all squared away before I want to delve into any more details but I think it could be a great solution to all this cool stuff that is lurking in our closets and our garage (no basement here!). I plan on using the pop-up as a way of culling down some of our other items as well – now that we’ve moved twice in the last three years, there’s some treasures from our STL house that I can already tell won’t really fit into our new house (like the three piece vanity mirror I had in our STL bedroom among other things). I set a lot of it up to take some photos for my booth application and I noticed a pretty strong color/material palette …. what can you say, the heart wants what it wants. 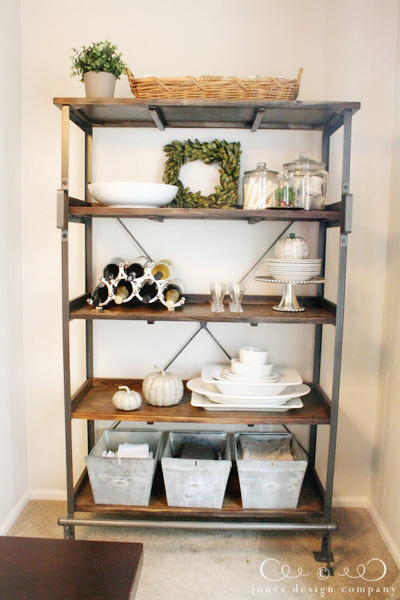 Yep, it will be good to start getting this stuff transitioned into new homes! Also, Rebel … she’s still learning how to use pillows. I’m pretty sure she was an outside dog before (not anymore – this is Arizona for chrissakes). The ceiling had another leak which the plumber deemed to be “Phantom Leak Syndrome” (for real, what a joke) and so we’ve had the rug rolled back and she seems to like the backing side better than the rug side. She’s a silly one. This was after her first trip to the groomers. I think it was somewhat traumatic for her shy self but much-needed because she was getting pretty matted. When she came back home, she was grumpy and pretty much slept all day. It’s become a vicious circle that I shouldn’t complain about – part of the reason for starting up the Etsy shop was to have a forum to sell off some of the extraneous décor items I seem to have acquired over the years. However, to fulfill my shop proprietor duties, I need a full shop and that requires hitting the thrifts. And to complete the circle, (shamefully) not everything I buy for the shop makes it to the shop. So here’s the new adoptions. They seem to be mostly of the animal variety. First off, the quail. We have real life Gambel’s quail that live in the area and visit our backyard daily on their pilgrimage to their nightly roost. I love their little Marvin the Martian plumes and how they run about and cluck at each other. So when I found two little quail figurines I just couldn’t resist …. We got our Christmas décor up this weekend and right now the quail are nested under the tree with the presents. We ran out of decent daylight to photograph the rest of the holiday décor but I’m going to try to capture it all next weekend. I hit up Home Depot and between paddle wire and clear 3M Command hooks I have McGuyvered some great stuff together. I love having the white lights on in the evening – both on the tree and swagged about every which way. Another animal friend that stayed with us is a little vintage looking brass reindeer dish I found yesterday at Super Sale Saturday (half off everything except new and seasonal) at my local Goodwill. In theory he would be considered seasonal and exempt from the sale but the harried sales clerk rang him up with all the other bound-for-Etsy stuff I purchased and I didn’t notice he was discounted until I got home and reviewed my receipt. Merry Christmas to me! And finally, the last Merry Christmas to me item we picked up at Savers today. 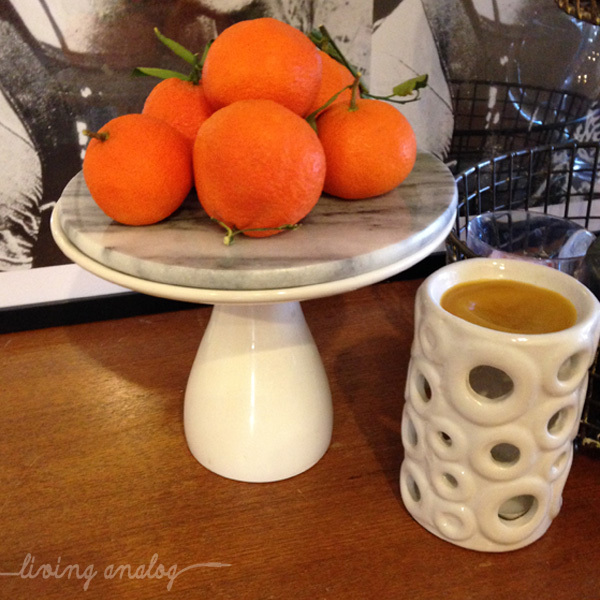 It is one of the ceramic Jonathan Adler phone docking stations. He’s not vintage so he’s not eligible for Etsy and at $2.99 it sure beats the original $48 that was the retail price. A cool place for my phone to hang out at night. Anyone else guilty of shopping more for themselves than others this holiday season? We have all our gifts finished and wrapped except for one. The out-of-town items are all going to the post office tomorrow. Keep an eye on the mail! Happy Tofurkey Day to all! I think I’ve mentioned it here on the blog before but JT and I have always dreamed of one day doddering away our time in a joint venture, “Thompson Guitar and Thrift” – a store full of amazing guitars and vintage furniture and objects – kind of just a place you would want to hang out in all day. Add in Sophie and Shenanigan as two lazy shop dogs and you’re painting my dream picture. At any rate, a brick and mortar store isn’t something we’re ready to commit to at this point in our lives. We both have full time day jobs and frankly like the security and 401ks those bring. But we still dream of the shop and so we’ve both taken (online) steps to make our dream a reality. JT has been doing the guitar thing for a while now, first on eBay and now on Reverb. Reverb has been great for him – the percent they take from your sale is way less than eBay and Reverb is geared right at him and his fellow musicians. JT has his very own Black Friday sale running until Sunday evening. He’s got some good stuff squirreled away — the ’78 Fender Telecaster, a whole Strat or just a Strat body and pickguards galore. You can see his store here. He has 24 reviews right now and I think they’re all five star – he’s a responsive seller and he knows his guitar stuff. Not to be left behind, I decided to open my own store on Etsy, focusing on the vintage goods side of things. It kind of grew out of necessity as I was bringing so much stuff home that the house began to feel like it was overflowing. The online shop became a reality last week and I already made my first sale – you can find me at Thompson Thrift! Both JT and I have the same philosophy when it comes to curating our shops – we make it a point to only offer items that we would buy for ourselves. In fact I keep making side eyes at the copper colander I have up right now … maybe I will set it out as part of my Tofurkey Day table setting. I made a little photo shoot spot in the breakfast nook window as it faces north and gets nice diffuse light. The Ikea faux sheepskin has been working hard as a nice wintery neutral background for my photos. I’ve actually been photographing everything with my iPhone using the Camera+ app – it has great controls for focus and brightness along with handy little grid lines to help center things up. I also started using the Google photo drive to quickly send all my photos to the computer where I can edit and upload them. I don’t think this Etsy venture is going to be a path to quick riches but it’s a fun hobby and helps justify my weekends spent at the thrifts. It’s an age-old conundrum – once you are seeking something specific, you cannot find it. The universe hides it from you (or something). Well universe I need a set of shelves for my kitchen and you can stop playing around now, okay! Why leave such a random hole in such a random place. 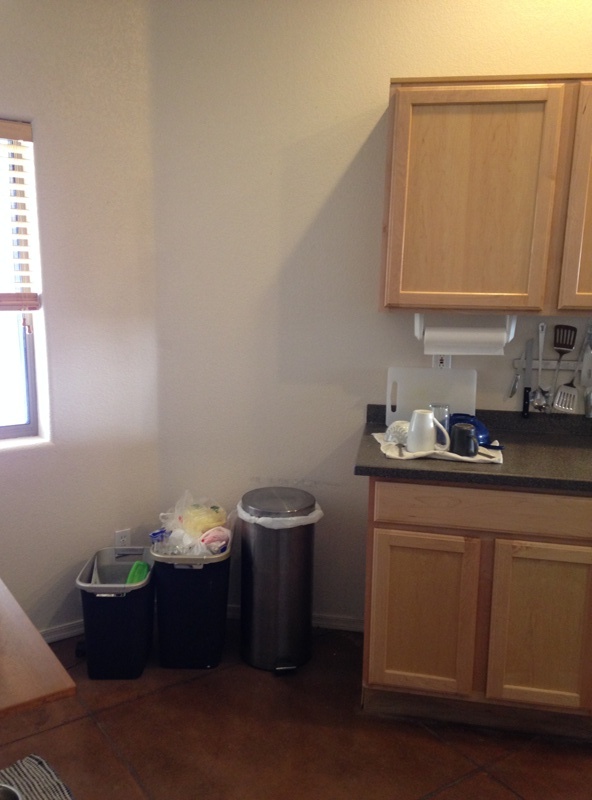 Run the counter top to the corner. Put in a few more cabinets. You’re killing me Smalls. What’s really killing me is Craigslist. I think I may have taken St. Louis offerings for granted but the general style in Phoenix seems to be too much money, not enough good taste. 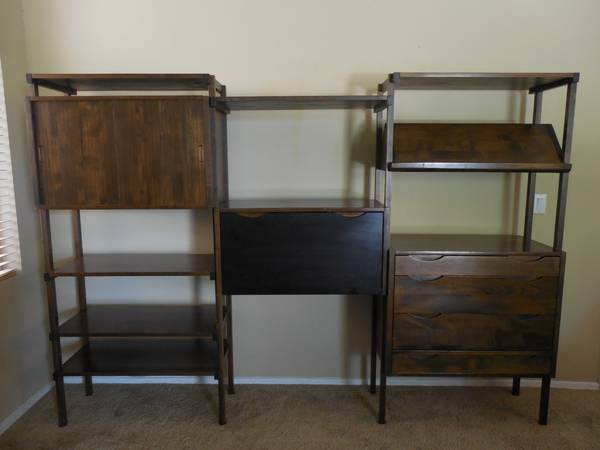 Above is what I have been finding when I search “baker’s rack” on Craigslist Phoenix. Not quite our style here at Living Analog. So, like my “Dreaming Of” post, I thought I’d be more proactive in this needle-in-a-haystack search and tell you guys what I am looking for. 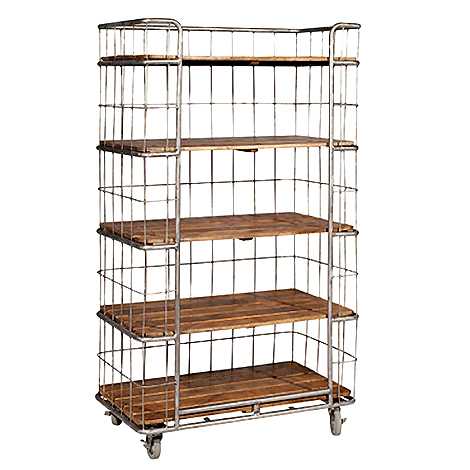 For starters something like this gorgeous industrial bakers rack via Hudson Goods. 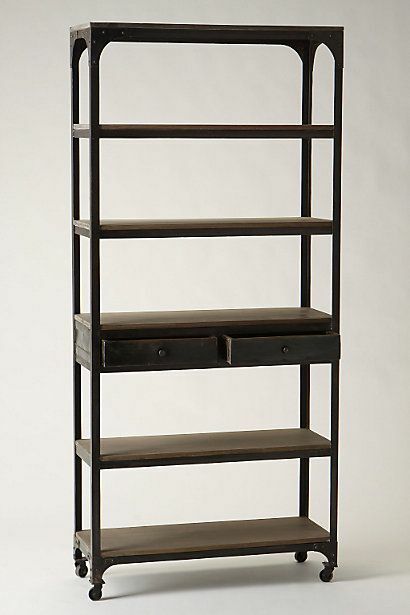 This one was listed for $1089 . . . .
Or the amazing Decker Bookcase from Anthropologie at a mere $798 . 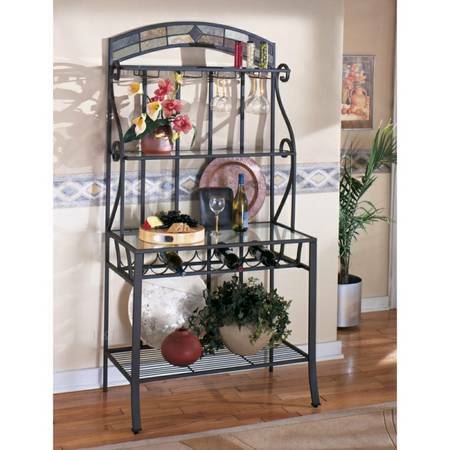 . .
And one runner-up – the Emerson Bookcase from World Market as styled and lived with by the lovely Jones Design Company. Getting better on price at $349 but still too wide for my weird little space. I did find something to buy on Craigslist under my search term “shelves” . . .
Well I have picked up a few household goods on my thrifting expeditions. 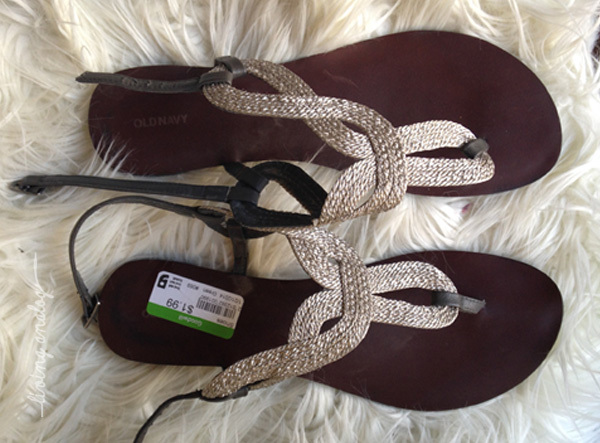 When I was out at Goodwill and grabbed up the sandals, I also saw a little piece of marble looking for a new home. For $2.99 I saw it and immediately formulated a plan. How my brain can rationalize a purchase while I stand in the aisle of the thrift store and look at something is a special talent I appear to have honed. At any rate, here’s the plan: Cake stand makeover. This one. It has a dirty secret. 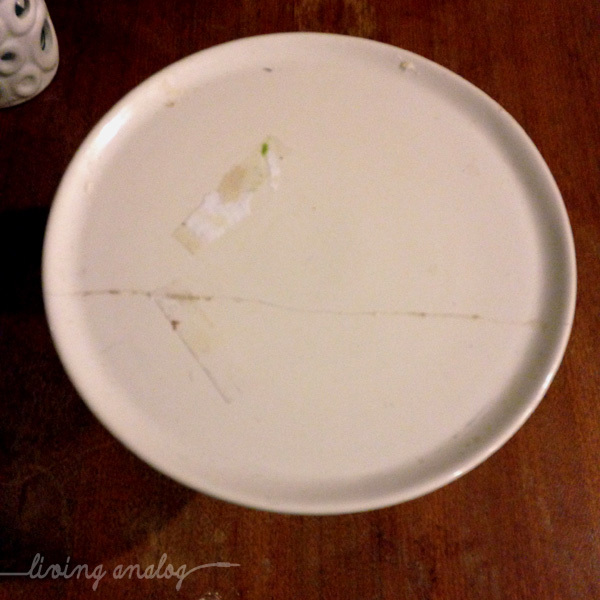 This poor little cake stand (a Pottery Barn wedding gift) was broken somewhere around the vicinity of 8 years ago. I managed to glue it back together fairly cleanly, but the crack line was still visible. So to hide it, I would use double-stick tape and cute scrapbook paper over the top to match whatever color scheme of whatever party/event I was using it at. However this is not the most cleanly of uses for daily life. 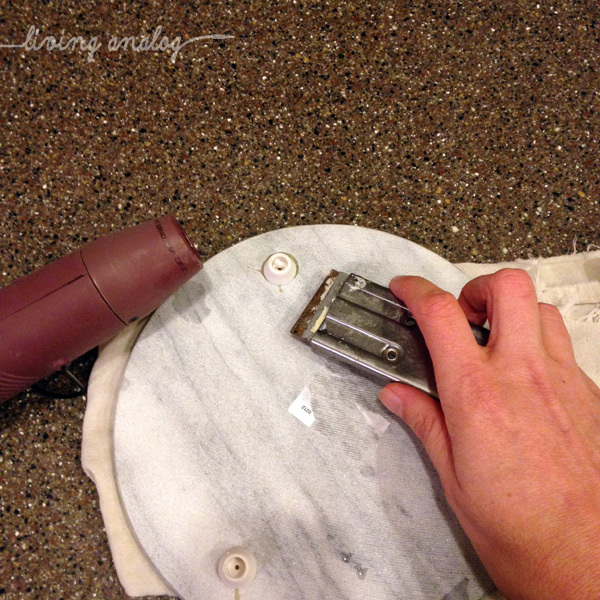 Sub in marble for scrapbook paper and we have a much more permanent and beautiful solution. The marble round had little ceramic feet attached to it which I vanquished in 5 minutes with the help of a heat gun and a scraper blade. 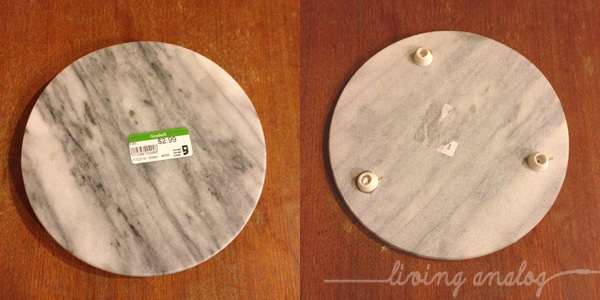 When I was standing in the aisle at Goodwill, I was thinking the marble trivet would probably be a tad larger than my cake stand but it turns out they are dead on the same size. So far it is working out well and my little cake stand is really more of a produce stand. There’s a place around the corner called “Summer’s Fruit Barn” that I visit usually at least twice a week. The produce here in AZ is all so fresh and cheap, it’s great for a veg head like me. 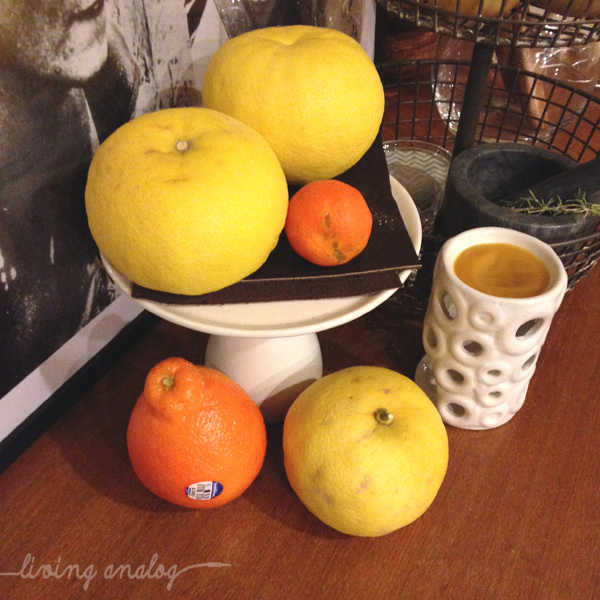 Today’s tangerines looks so cheerful on their new (old but revamped) marble throne. I am by no means, any means, a “fashionista”. I am however, most definitely a thrifter. I love the hunt and I can go hanger-by-hanger through miles of racks searching for that one piece of clothing that looks like it just might work for me. (And then I try it on. I try everything on. Everything.) Sometimes you have to dig . . . So this is not a post about what is in fashion (whatever that means) but more a post about how I go about acquiring my “fashion” in a thrifty way. 1. Donate. It seems counter-intuitive to give away clothes when you feel like you have nothing to wear but it’s good to clean out some closet space and edit out the things you’re not wearing. I keep two bags in my closet (our new oversize walk-in closet, so the lap of luxury!) for quickly sorting items. 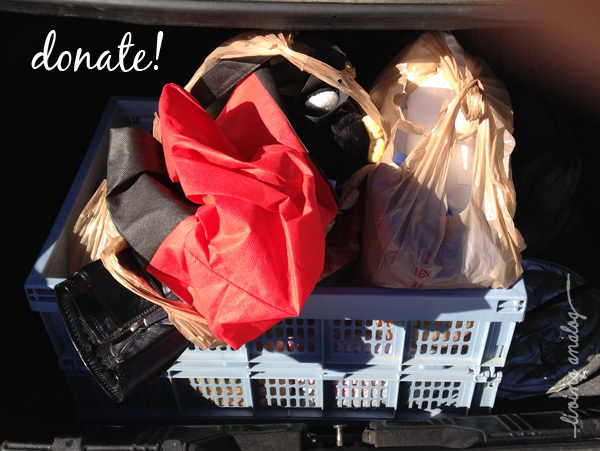 Bag #1 are clothing items that need to be recycled – things that are stained or torn beyond repair. Bag #2 is a donate bag for things that don’t fit right and/or I just looked at 500 times and realized I will never wear it. Probably because it doesn’t fit right. And for me, that’s why the bags have to be IN the closet – I have a tendency to just drop something into the hamper that I wore and pulled at all day and/or felt uncomfortable in. Who wants to feel self-conscious or uncomfortable in their clothes? Not this girl. (Then when the bag is full I give it a quick launder for good measure.) Donate it and get something you LOVE to wear. Also, on my last trip to Saver’s, I got a 30% off coupon in exchange for my donation. Another plus in the donation column. 2) Shop on discount days for higher savings. In Phoenix, Goodwill has 50% off days two Saturdays a month and Saver’s has them for major holidays (like MLK Day.) Get on the email lists of thrift stores near you and find out when the savings days are. I received a 20% coupon to Goodwill for joining their email list. But be prepared for the discount days to be hectic in there. If you can’t deal with crowds, you’ll have to pay full (thrift store) price. Not sure what thrift store are near you? Check out The Thrift Shopper for a search by zip code directory. You’re welcome. (Note: I am not crazy about how I look in this picture but it’s the only one we took and I’m trying to get over my camera phobia so here it is.) This dress I found at the half off day at Goodwill and was only $2. It’s the Inc. brand from Macy’s and I’m totally a blue girl so I knew I could accessorize it up. 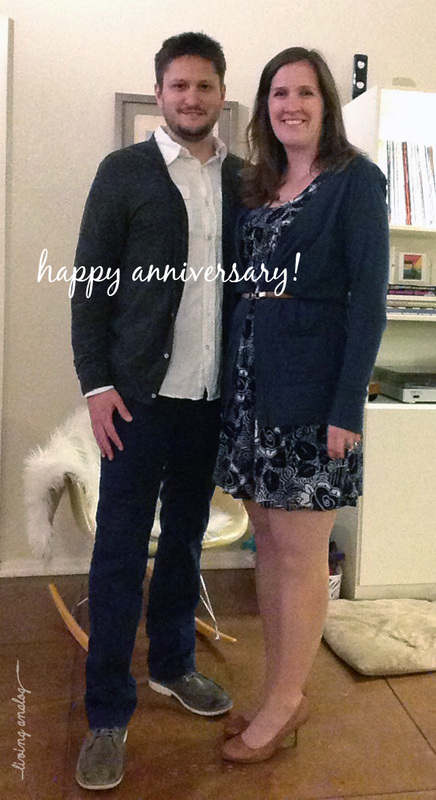 I wore it out with JT when we went out for a belated 9-year wedding anniversary dinner a few weekends ago. 3) Know what you’re looking for. 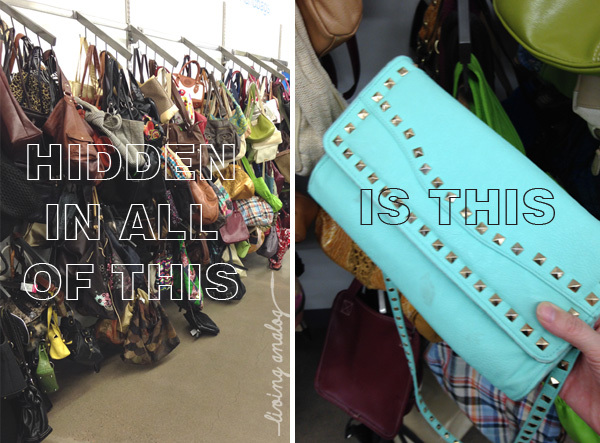 Thrift stores can be overwhelming so go in with an idea (albeit loose) of what you are looking for. I’ve targeted different ideas: cute layering sweater, loose hang-out-around-the-house-but-still-look-cute Tees, work-appropriate skirts or a new pair of sandals. You get the drift. And sometimes having multiple targets can help make your mission a success. My favorite thing right now to buy at the thrifts is belts – they make a huge impact to an outfit for usually around $1. 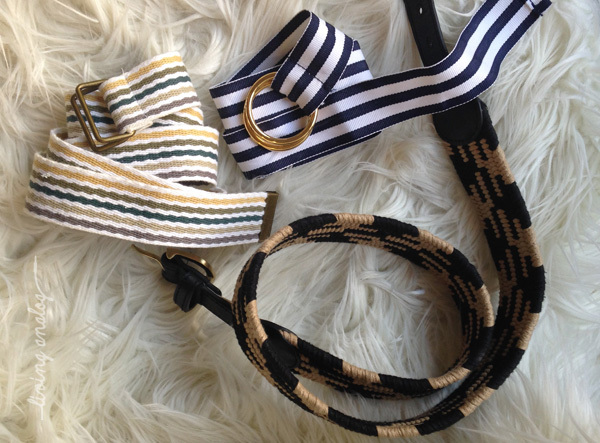 Not sure how long navy blue and brass will be in style? A $1 belt means you can be in on the trend and not be sad when it goes out again. These are all belts I have found at the thrifts. The black and natural one was at the Goodwill on Watson near Crestwood Mall (is it still Crestwood Mall?) Goodwill actually gets a lot of Target items that have never been worn – this is one of those and it was more than $1 (I think I paid $4) but still way less than it would have been at Target. 5) Get creative. I had on my “to hunt” list a maxi dress – I’m anticipating hot weather in my future (duh it’s the desert) and so it seemed like something I might get some use out of. On my trip to Saver’s during the 50% off MLK bonanza, I found something with potential but it wasn’t quite right . . . So I took a $4 chance and brought it home . . . Sorry for the weird, in-the-mirror selfies. Fashion blogger I am not. 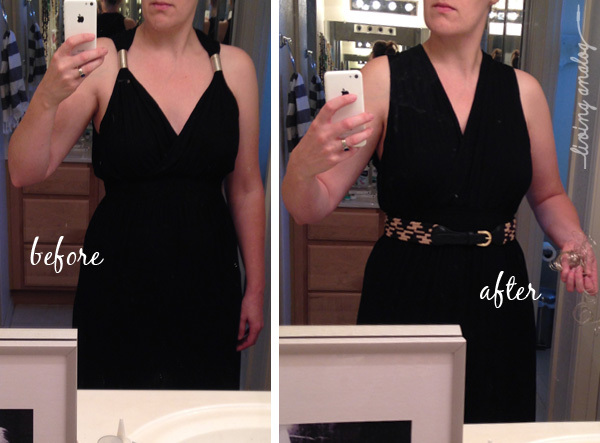 At any rate, I had checked it out in the store and it looked like the two small slinkies were removable so when I got it home, I pulled them off, recycled them (sorry slinkies) and accessorized the dress with my thrifted belt. I have a feeling I will be wearing this a lot come June. 6) Check it over & try it on. There’s a lot of sub-components to this one but here’s the gist – make sure it fits well everywhere. Make sure there’s no stains, rips, missing buttons, etc. Someone donated it for a reason, sometimes the reason is a stain or a weird stretched out part. Thrift stores don’t have laundry facilities so be sure to fully launder and air out any purchases when you get home – don’t put it near the rest of your wardrobe until it’s been washed. 7) Know when to say no. I’m still learning this one but sometimes you have to put the thrifted clothes back on the rack and call it a day. And if you make it home with something that ends up not being the right fit, put it into the donate bag and start again with Step One.